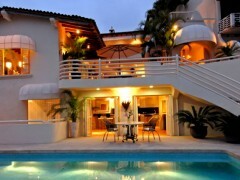 It is that Mexican charm that has made it a favorite residential area for artists and foreigners. 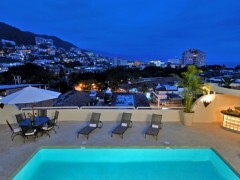 Located in downtown Puerto Vallarta on the hill above the famous Our Lady of Guadalupe Church, the winding cobblestone streets, brickwork, stone staircases, views of the city and sea below and lush bougainvillea and palms in the area make it easy to understand why the artistically inclined find inspiration from this Vallarta neighborhood. The Gringo Gulch area was first made famous when Richard Burton bought a villa for Elizabeth Taylor at Zaragoza 446. After they were married, the couple also bought the house located directly across the street which they connected to the first home by a passageway. Today the Gringo Gulch neighborhood offers wonderful restaurants like the gorgeous Hacienda San Angel, Spanish tapas from Esquina de los Caprichos and the French bistro-styled La Cigale. 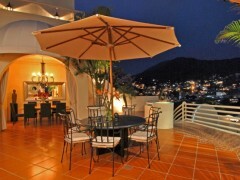 It also is just steps from the Puerto Vallarta Malecon and the artistic and culinary scene of Isla Rio Cuale. Homes in Gringo Gulch include large traditional villas, many stunning renovated to include every modern luxury while maintaining their Mexican charm, and smaller condos with ocean and church views. Let our Real Estate experts at Luxury Beach help you find your dream Puerto Vallarta home in the neighborhood that best suits your lifestyle. Fotos of Casa Tabachin in Gringo Gulch. Discover Casa Tabachin in Gringo Gulch, a beautiful home just next to Casa Kimberly.